← WagFest 2012!!! Canine Cavorting in Seattle This Sunday! 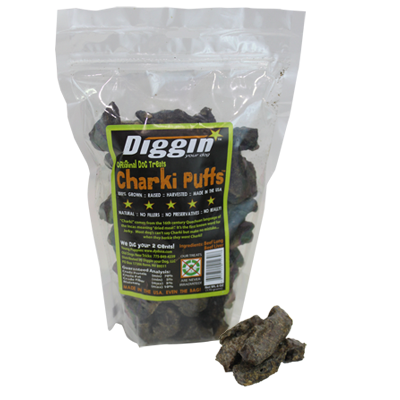 Awesome Treat Alert – Charki Puffs!! The nice thing about moving somewhere new is that you get to find great foods that you wouldn’t otherwise have the opportunity to try. This is true for people food and doggie treats! My dog Pipa is a notorious food snob. Biscuits are pretty much out. And it basically took 5 years to find a dry food she was willing to eat without glaring at me and making me feel like an abusive moron. Since moving to Seattle I’ve come across a treat that I wish we’d had during all of our travels… CHARKI PUFFS!!! Aside from being fun to say, I never find Charki Puffs hidden under my pillow because they didn’t live up to her descriminating tastes. Charki Puffs are made of 100% USA raised beef. They’re baked and puffed up to crunchy perfection then bathed in a luscious liver sauce. They’re made by Three Dog Bakery and if you can’t find them in your local store you can order them at Three Dog Bakery‘s site where they’re a mere $9 for a bag which lasts for ages. You won’t be sorry! Posted in Dogs and tagged dog treats. Bookmark the permalink.